Was A Hindu Woman Stripped By Congressmen For Raising Pro-Modi Slogans? Images of a woman being stripped naked in public with a fake narrative have made a comeback. A collage of two graphic images of a naked Adivasi woman being chased and beaten on the streets by a few men has made a comeback. The same images have been used in the past to malign the image of political parties. 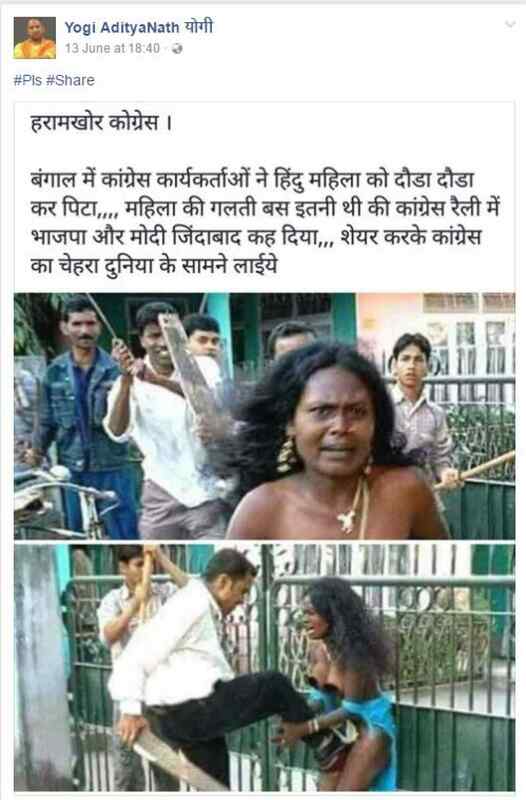 A Facebook page called Hindu Akhilesh Gupta claimed that the Congress party workers harassed a Hindu lady by beating and chasing her. The post claimed that the woman was assaulted for raising slogans in support of BJP and Prime Minister Narendra Modi in a Congress rally. The post further asks people to share the video so that the real face of the Congress is exposed. At the time of writing the story, the post had 15,000 shares with more than 800 reactions on it. You can access the archived post here. The same images were shared by a fan page of Uttar Pradesh Chief Minister Yogi Adityanath – Yogi AdityaNath योगी last year with the same narrative. The page at that time had almost 95,000 followers as reported by The Quint. The images were going around with a different fake narrative as well. The post claimed that TMC workers abused the woman. The post was debunked by SMhoaxSlayer last year. In 2007, The Telegraph reported that the incident took place in Assam where hundreds of tribals were attacked by the public. The woman mentioned in these posts was attacked by three men who stripped her naked. The woman in a state of panic and fear, ran until a piece of cloth was thrown at her. The report also mentioned that the girl was probably a participant in the armed Adivasi procession in demand of Scheduled Tribe status. Chief Minister Tarun Gogoi had announced the arrests of the three men who had been identified for assaulting her.